This delicious salad uses raw beetroot making a serving one of your five a day and rich in folate. Preheat the oven to 200°C, gas mark 6. Tip the hazelnuts onto a baking tray and roast for 10 minutes, until golden and toasted. Leave to cool then chop roughly. Blitz the juniper berries with the oil in a mini processor or pestle and mortar to make a paste. Place in a bowl. Finely grate the zest from the orange and add it to the juniper oil with the juice from half of the orange, and the balsamic vinegar. Whisk and season to taste then set aside. Slice the beetroots as thinly as possible with a mandolin or a sharp knife and toss in 2 tablespoons of the dressing. 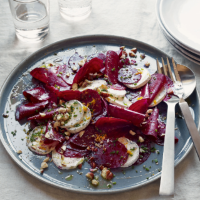 Scatter the dressed beetroots over a large serving plate, dot with thin slices of the goat's cheese, scatter with the hazelnuts and chives and serve drizzled with the remaining dressing. This recipe was first published in September 2014.